Be the first to share your favorite memory, photo or story of Gino. This memorial page is dedicated for family, friends and future generations to celebrate the life of their loved one. 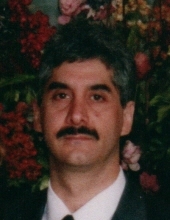 Zaguroli, Gino of Commerce Twp., passed away peacefully on February 4, 2019. He was 58 years old. He was born on August 5, 1960, one of five children to Dominic and Antoinette (nee. Liegghio) Zaguroli. Gino was a tool & die maker from an early age and loved working with his father. He was devoted to his pets, with his favorite Max. He had many activities that he enjoyed including going to the gym, the casino and boating when he was younger. He would often play games like chess, hockey and racquetball and could be found listening to the classics including two of his favorites being the Beatles and Elton John. Gino was shy, generous, with a laid back personality, spending the majority of his time with his family and especially with his daughter, Bianca, who was the highlight of his life and was most important to him. Gino is survived by his loving daughter, Bianca; his sisters, Rose (Jerry) O’Hara, Donna (Michael) Mehall and Sandy Stram. Also survived by many loving nieces, nephews, cousins and dear friends. Gino was preceded in death by his parents, Dominic Zaguroli & Antoinette Zaguroli and his brother, Dominic Zaguroli, Jr.
A Funeral Service will be held at Lynch & Sons Funeral Home, 404 East Liberty Street, Milford on Friday, February 8 at 7pm. Father Jack Baker to officiate. Friends may gather from 4 pm until time of service. "Email Address" would like to share the life celebration of Gino Zaguroli. Click on the "link" to go to share a favorite memory or leave a condolence message for the family.